The full length cut of Rob Johnsons stunning debut big walling adventure film. A maverick bunch of Brits go big wall hunting in Brazil. The full length cut of Rob Johnsons stunning debut big walling adventure film. A maverick bunch of Brits go big wall hunting in Brazil. 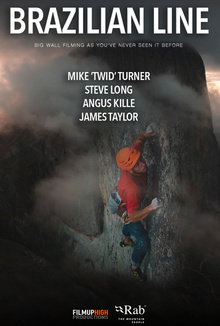 Lead by pioneering legend Mike ‘Twid’ Turner accompanied by Steve Long who invite some youth on the trip in the form of the super strong James Taylor and Angus Kille (just climbed Indian Face!). The team head for the giant monolith of Pedra Baiana dreaming of a new line on perfect rock. From the outset the plan begins to unravel with fuel blockages, wasp attacks, a shortage of equipment and time all pinning back progress in this spectacular, insightful and charming film.